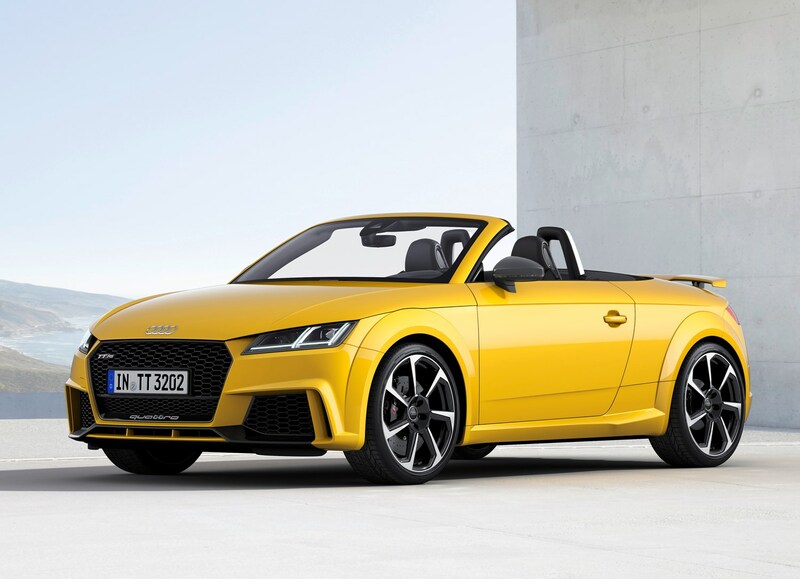 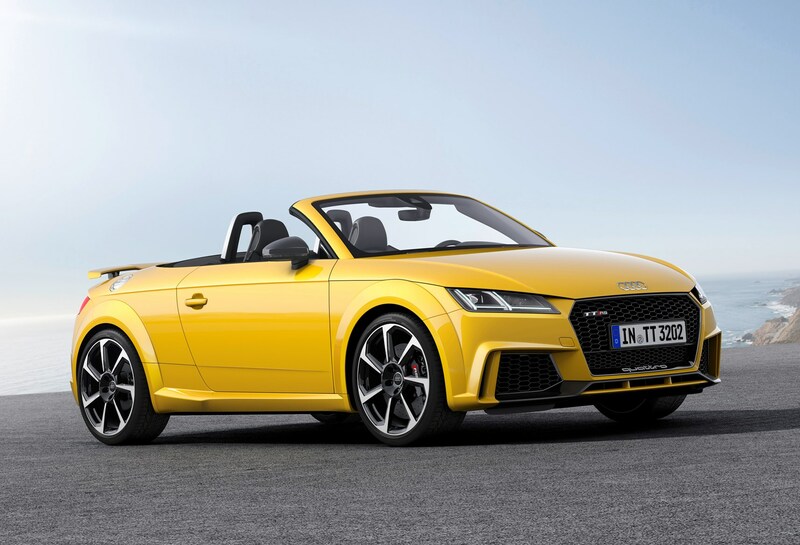 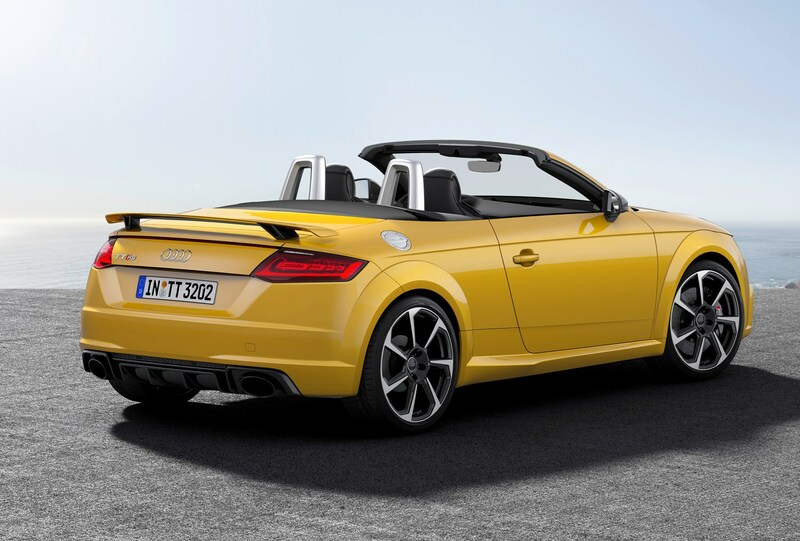 The new Audi TT RS Roadster features a five-cylinder petrol engine brimming with power and character – and what better way to experience it than through a convertible’s open roof? 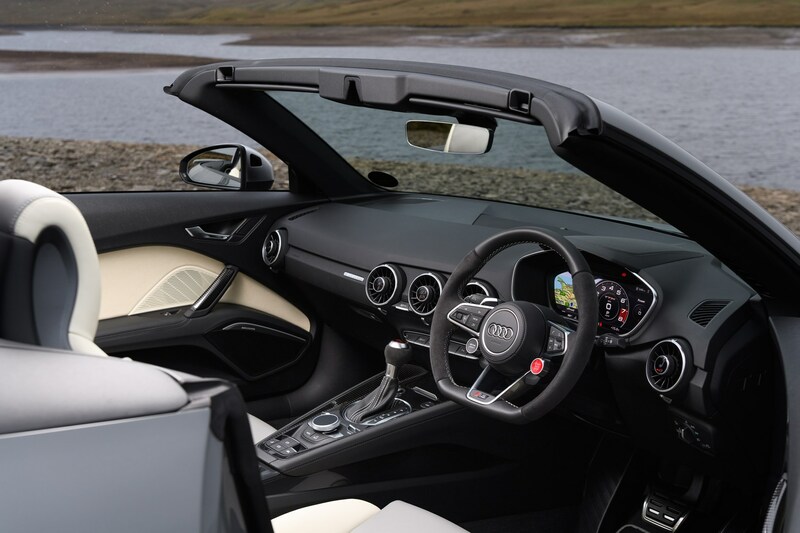 Unlike other sports cars – the Porsche 718 Boxster, for example – the new TT RS Roadster has stuck with the previous version’s 2.5-litre displacement. 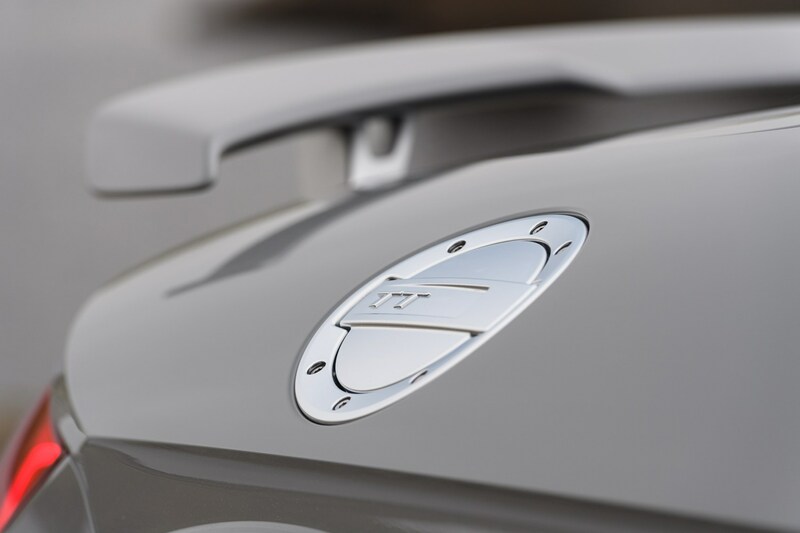 This time around it features a lightweight aluminium construction and extra 59bhp for rapid performance. 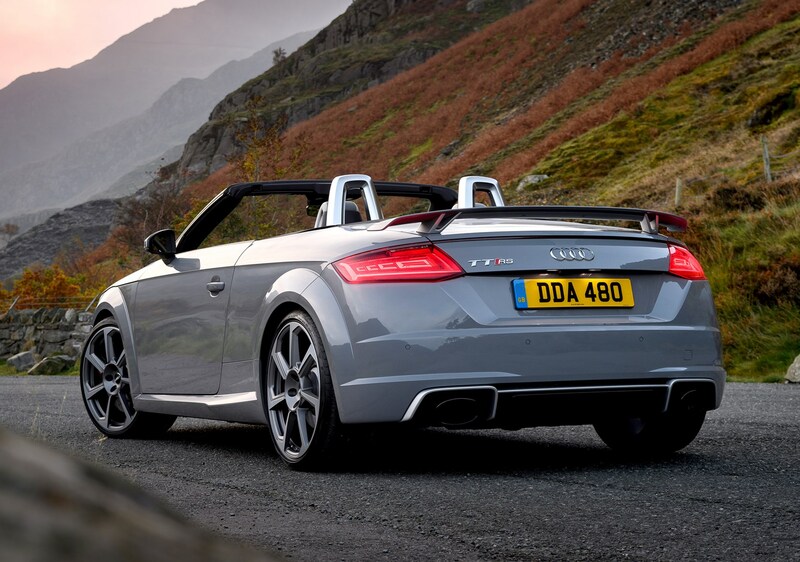 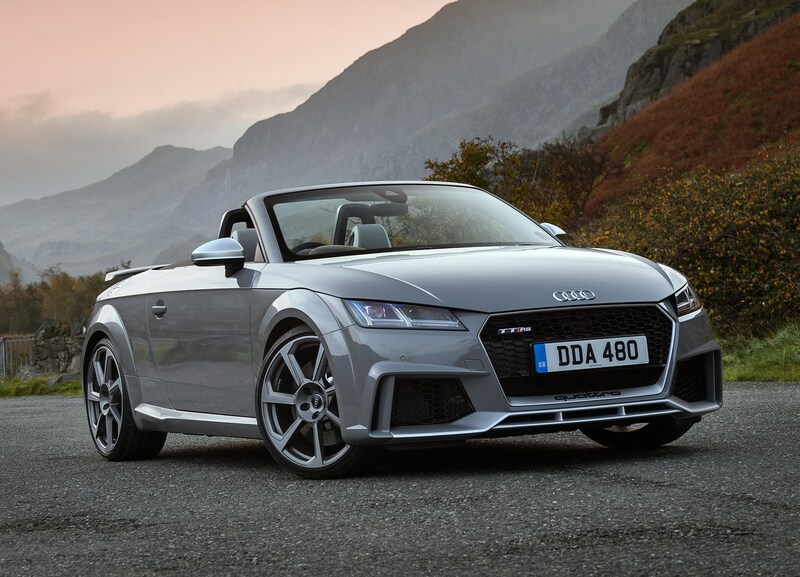 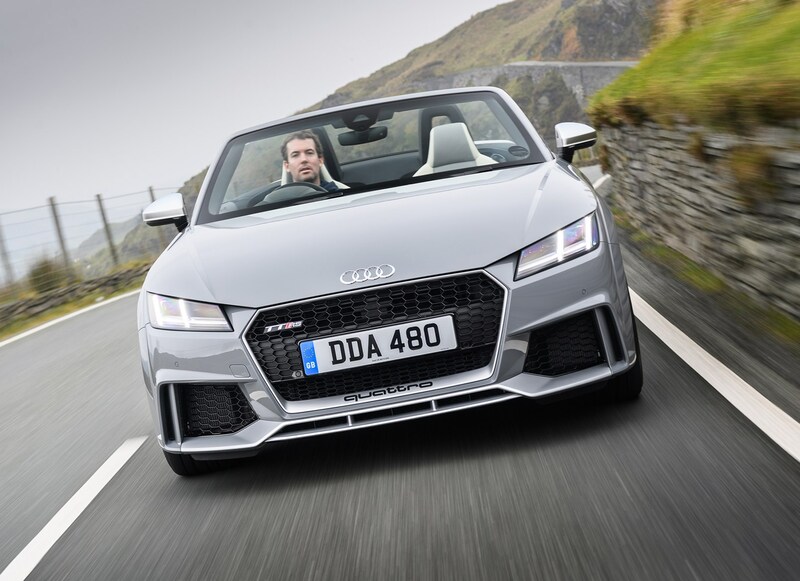 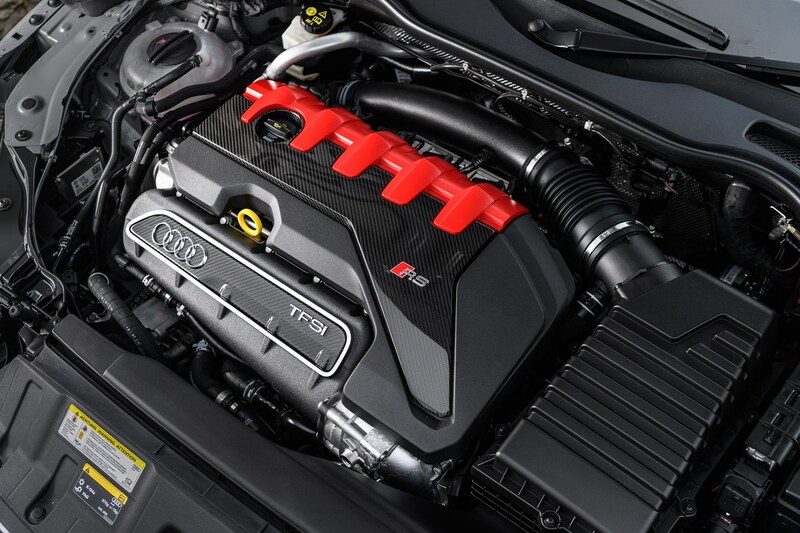 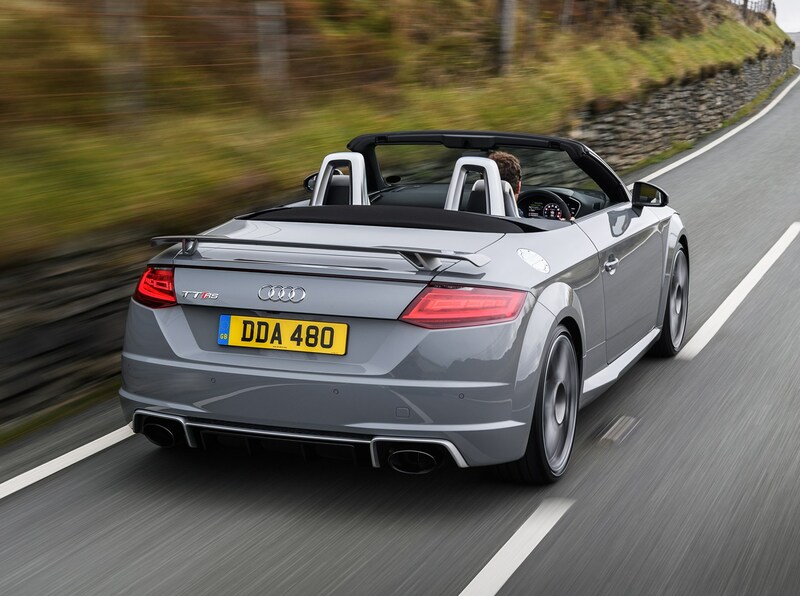 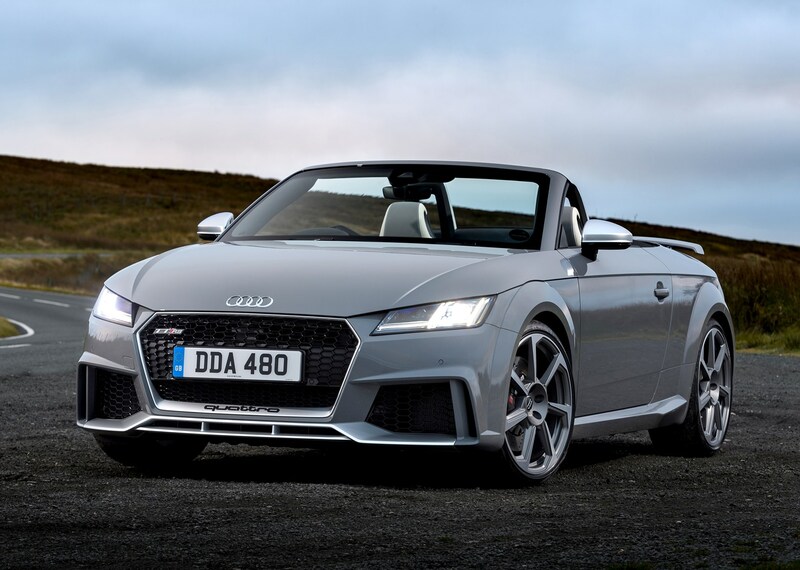 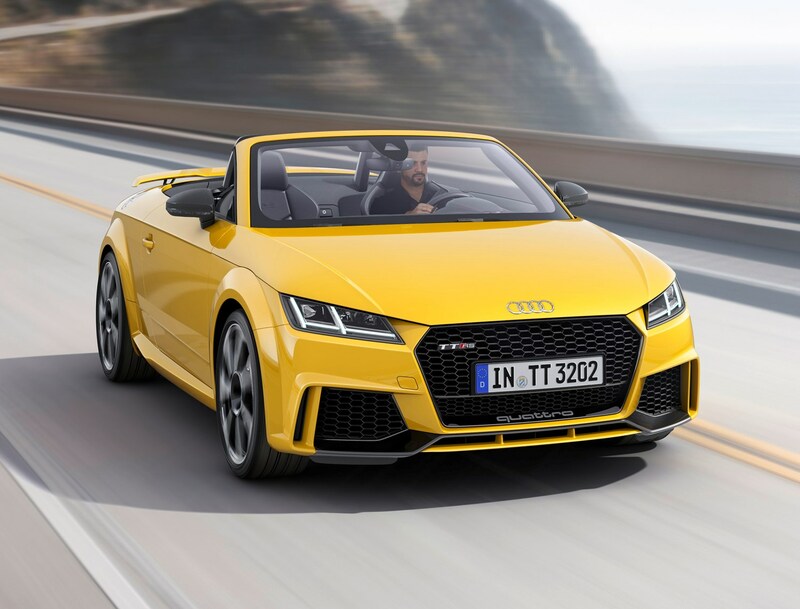 While two-tenths slower than the Coupe version, the TT RS Roadster will still dispatch the 0-62mph benchmark sprint in 3.9 seconds thanks to 480Nm of torque available from 1,700rpm all the way through to 5,850rpm. 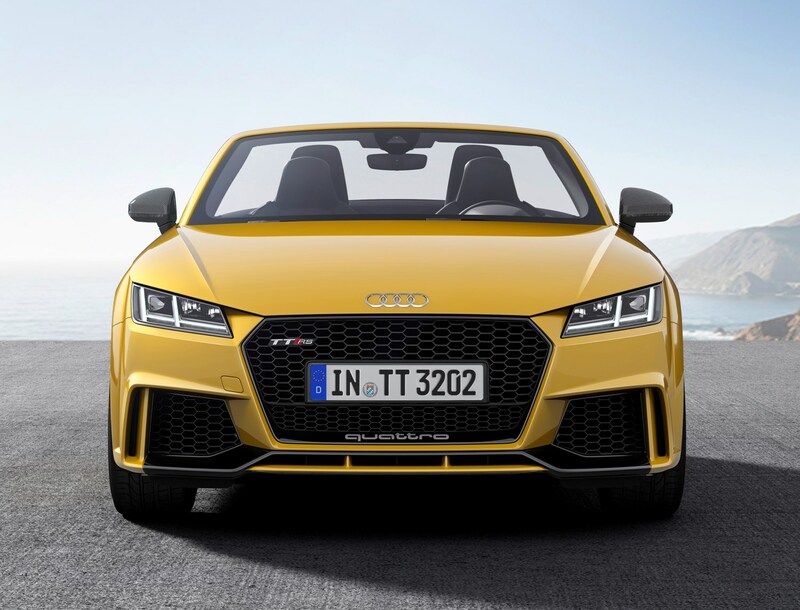 Despite 395bhp being on tap, the TT RS tops out at a limited 155mph, while the electrically operated roof can be raised and lowered at speeds of up to 31mph. 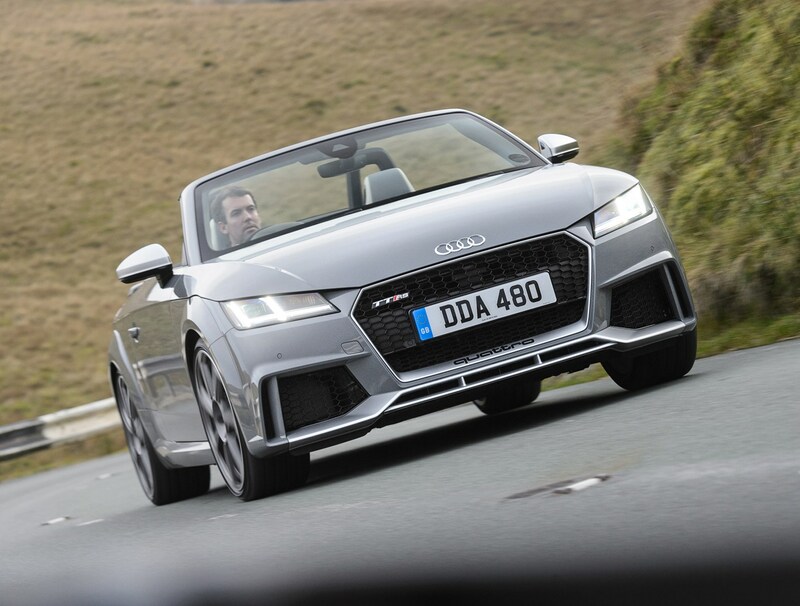 That unusual five-cylinder configuration gives it an off-beat rhythm and deep, powerful sound very unlike a more mainstream four-cylinder engine. 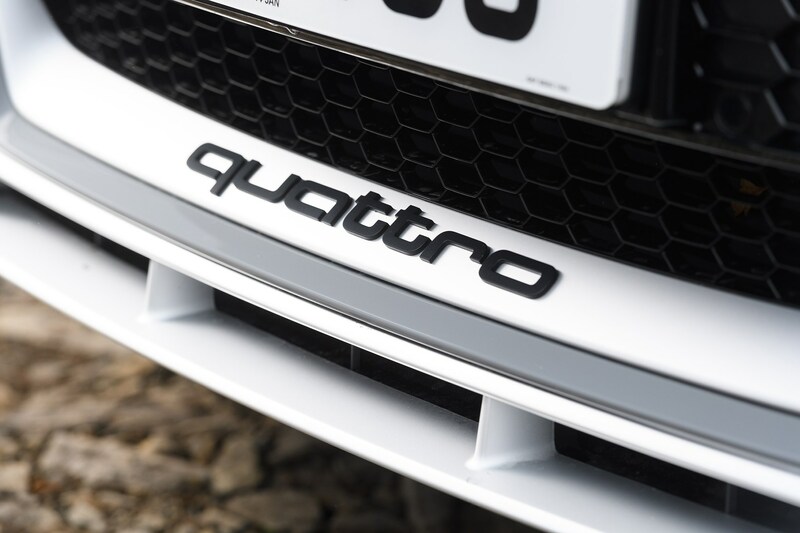 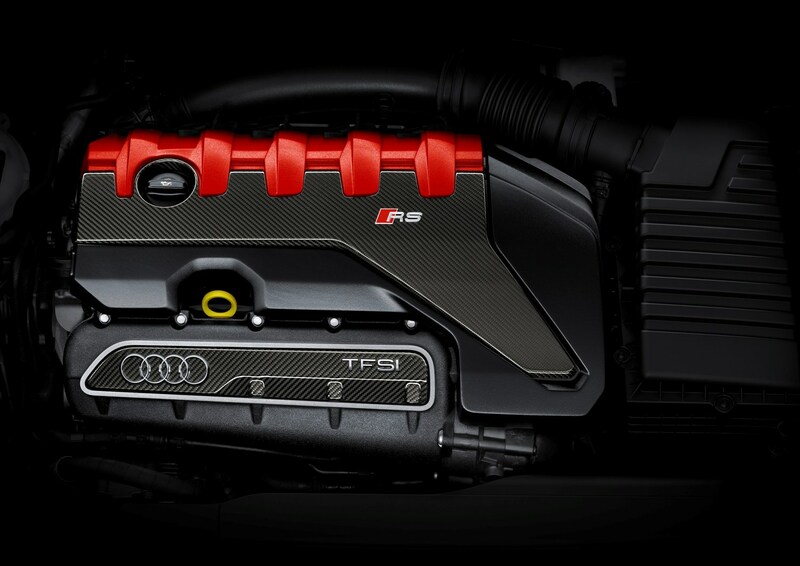 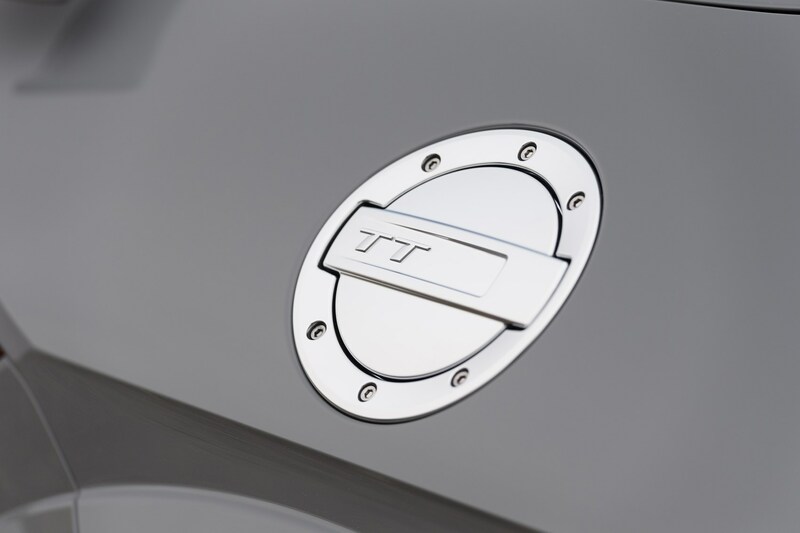 All-wheel drive is standard for the TT RS and you get bold Quattro badging on the front valance to announce this to the world. 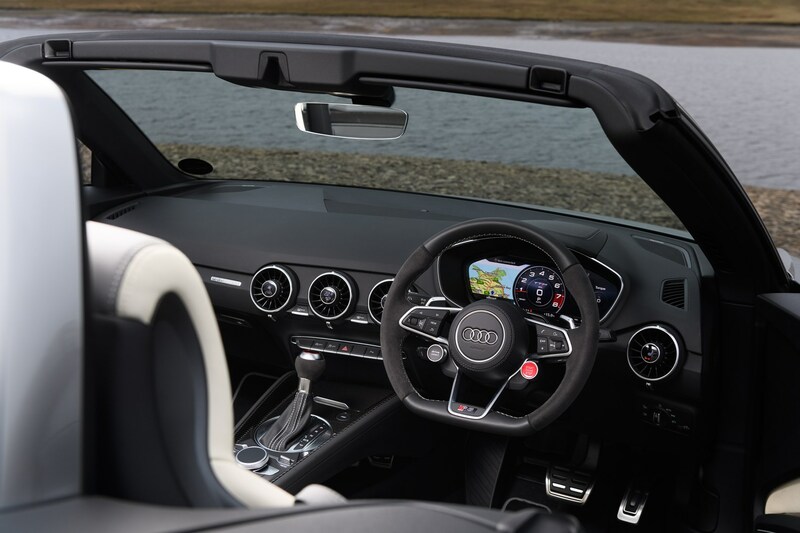 The character of the convertible can be tuned by the Drive Select System, which also alters the steering, automatic gearbox, engine response and exhaust note through Comfort, Auto, Dynamic and Individual modes. 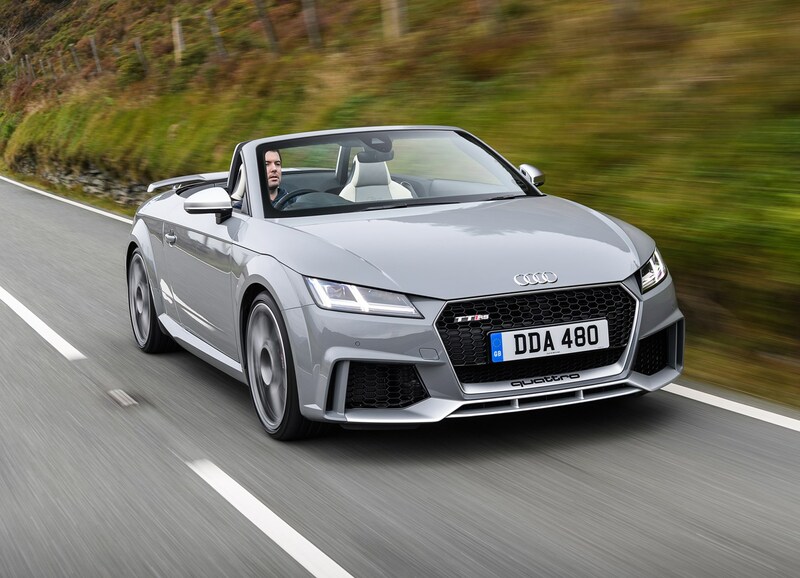 There’s a 10mm drop in ride height and a standard seven-speed dual-clutch automatic gearbox with shift paddles, launch control and short lower gears for punchy acceleration. 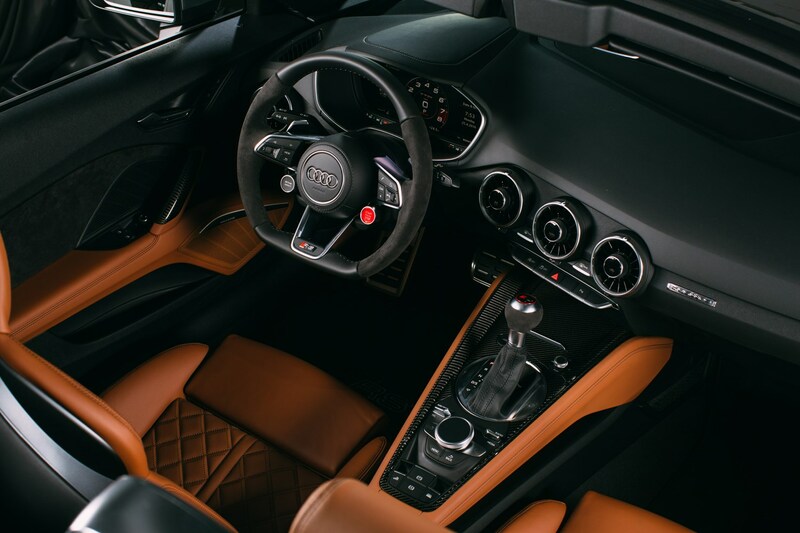 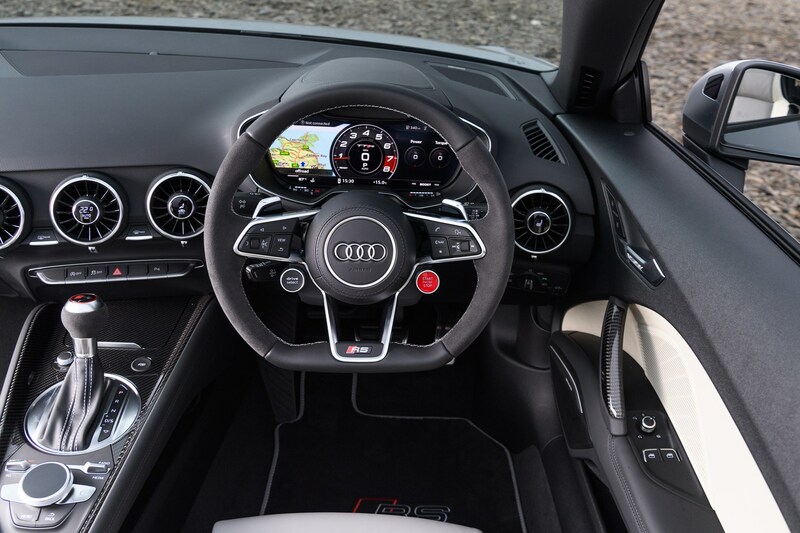 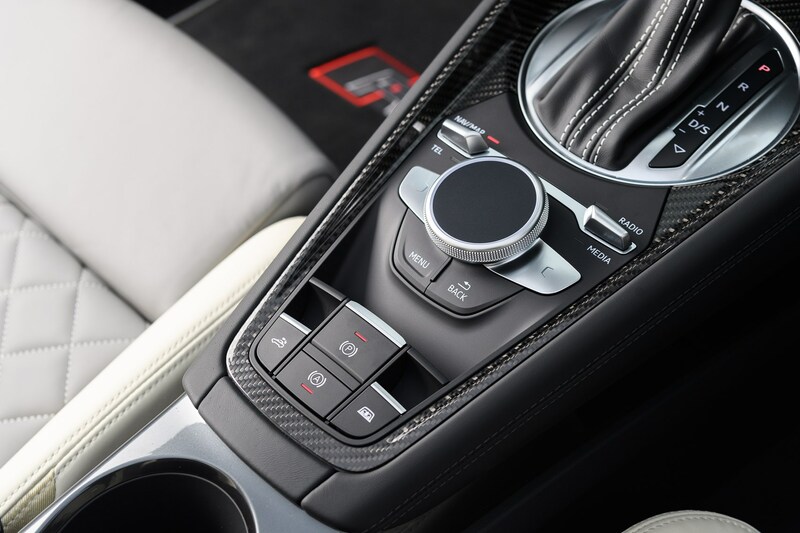 Slip behind the sports steering wheel and you’ll notice the two satellite buttons for starting the engine and adjusting the driving dynamics, just like an Audi R8. 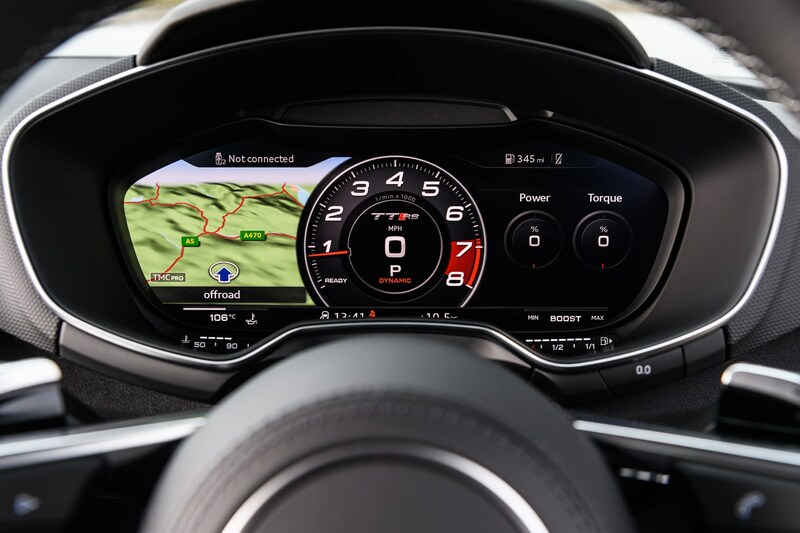 There’s an RS-specific skin for the 12.3-inch Virtual Cockpit with a bold rev counter and read-outs for tyre pressure, torque and g‑force, plus a shift light when using the manual paddles. 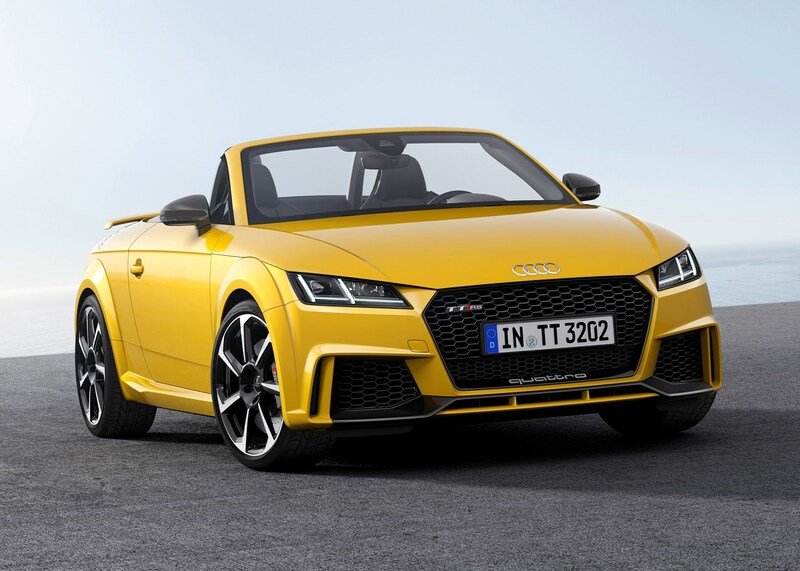 If that standard fixed wing is a bit too much you can spec the retractable one from the normal TT range for a stealthier look. 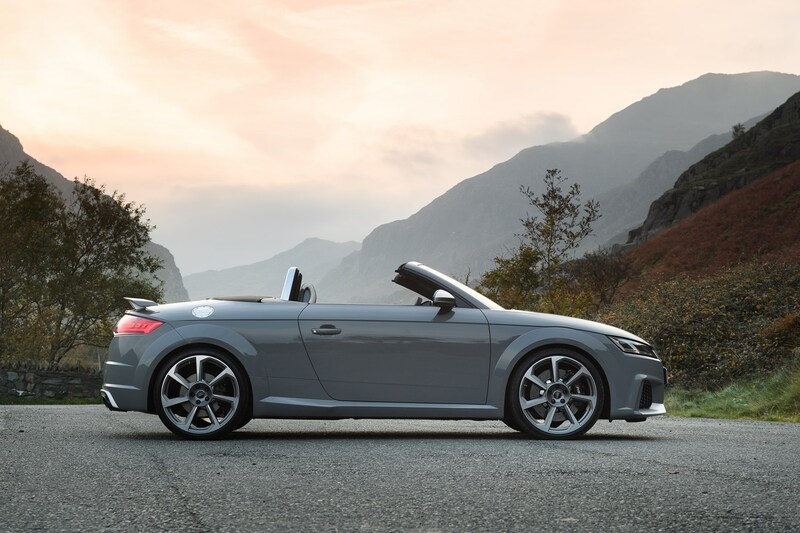 Wheels come in 19- and 20-inch designs and you can have the spokes picked out in black or silver, plus there are optional aluminium accents for the front and rear bumpers. 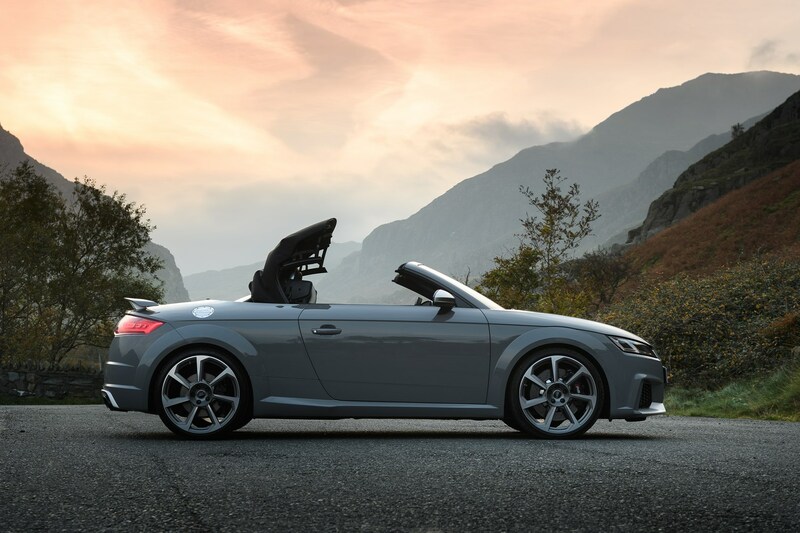 RS-specific paint colours include Nardo Grey and Catalunya Red, and if you pick the optional ceramic front brakes they come with grey callipers, too. 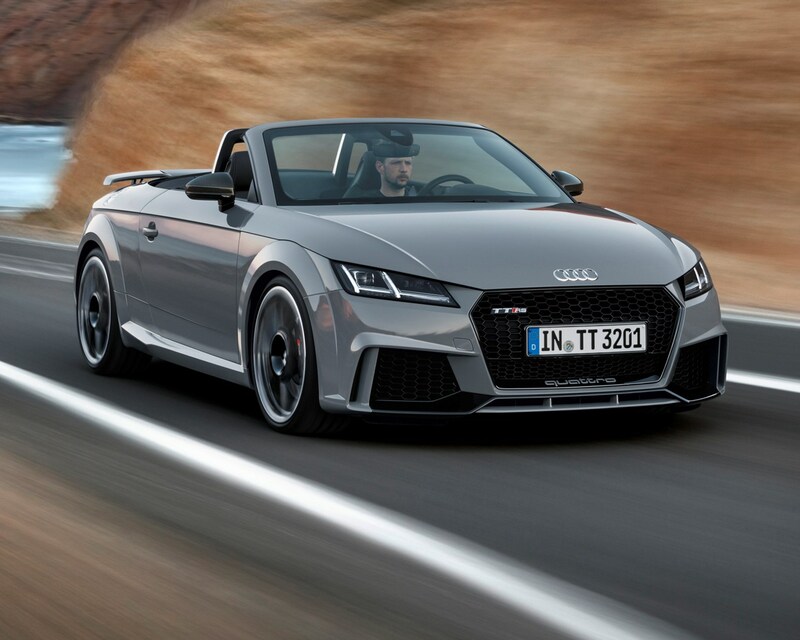 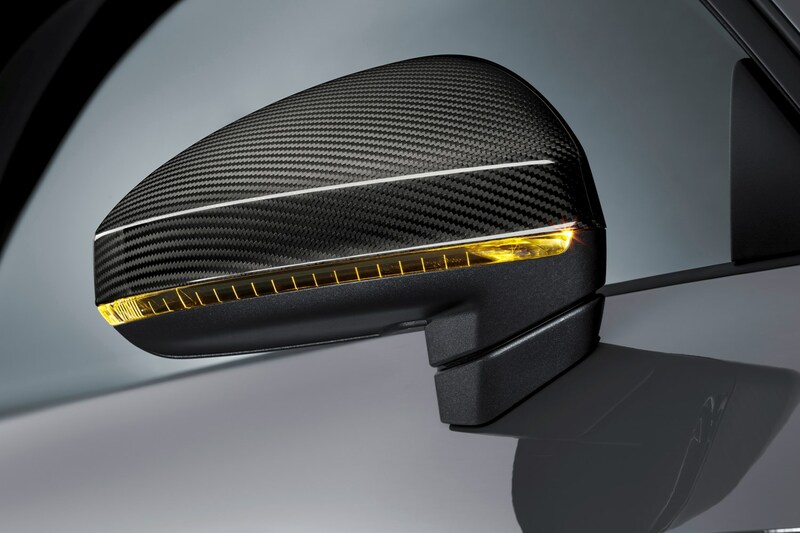 There’s a louder sports exhaust that also adds black tailpipes, the loudness of which can be accentuated via a button on the dash, and finally a set of super-sharp OLED tail lights. 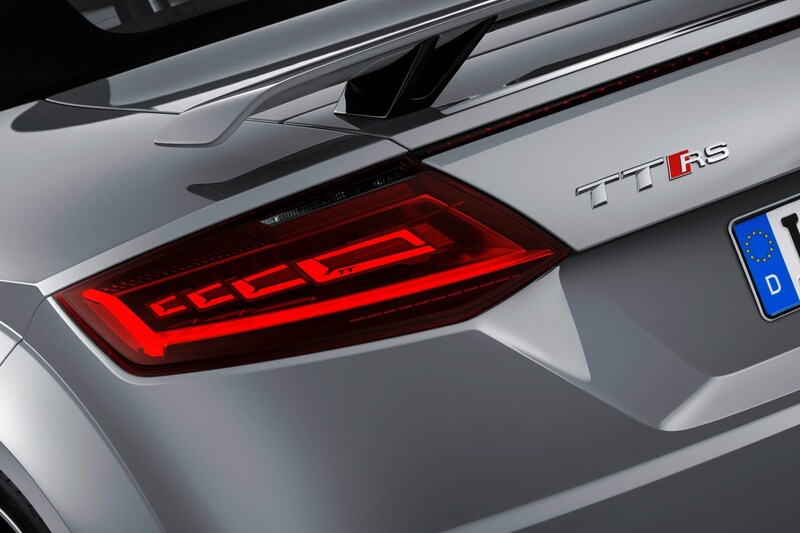 These are made up of four reflector-less, wafer-thin rectangular units, increasing in size with the largest featuring a TT logo and Audi rings.